We want to help you reach your goal! Congratulations! You are now ready to meet your fundraising goal! Let's get started by getting familiar with your profile. In addition, let's get your profile ready for people to view! When logged in you can visit your dashboard anytime by clicking on the "My Settings" button in the upper right hand corner of your screen, then choosing "Account Settings". While in your dashboard you can edit your profile, upload photos, integrate with your google blog, create a friendly URL, and so much more! Log into your profile at continuetogive.com and get started! Write a mission statement and description to tell people what you are raising money for and how they can help! Create a friendly URL so your donors can easily find your page! Don't forget to save your changes by clicking the "Save Changes" button on the bottom of the page! Upload pictures and videos that tell your story. Let people feel like they are right there with you making the world a better place! Go to your dashboard and click on the "Photos" tab. Browse your favorite pictures to add to your profile! Go to your dashboard and click on the "Videos" tab. Copy and paste your youtube link, add a description, and click "Save"
Keep people up to date on what you are doing by letting your blog post right onto your Continue to Give profile page! Find the "Set Up Your Blog" green box and click the "Click here to grant access"
Share your page on facebook or twitter with all your friends! Let them know you created a Continue to Give profile page and you are looking to fundraise! Let them help meet your goal! Click on My Setting in the upper right hand corner of your screen, then click your fundraiser name. This is what your fundraiser looks like to givers. Let's get you started by setting up 4 easy ways for you to receive donations! Once you are set up, donors will be able to give by mobile, online, kiosk, or Facebook avenues. This will allow you to cater to a multitude of preferences. 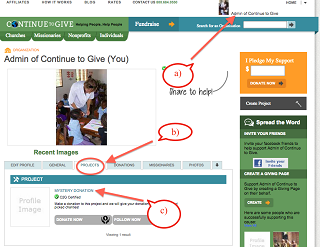 Four Easy Ways to Get Set Up to Receive Donations! Click this button on your Continue to Give profile page to get your free QR code! QR Codes and Text to Donate numbers allow people to easily donate right on their smartphones. Go to your dashboard and your mobile options will be right there! Choose which QR code size you will need then grab and drag it to your desktop as a png. Print your QR code and Text to Donate number on any type of Media. Congratulations! You are now set up to receive donations through mobile devices. Don't know what a QR code is? A smartphone readable square that allows people to donate to your cause right from there phone! 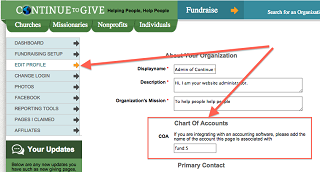 Badges allow donors to easily donate right on your organization's website without having to be redirected. Go to your Dashboard and Find the "Create a Badge"
Once you have selected a style you can change fonts, colors, and more! Once everything is the way you like it press the "Click here to get the code needed to display this badge on your website! or grab the link provided" to get the code you need. Click this button on your Continue to Give profile page to get your badge! Congratulations you now have a quick easy way for people to give right on your website! Click this image to download the free offering kiosk app! The offering kiosk app allows donors to give right then and there at the kiosk stand! Great for church tithing and fundraising events! Click here for full step-by-step setup instuctions. When on an Ipad or smartphone click the kiosk stand image on the right to download our free app! Not only can you make a button so donors can give on your personal website, but now you can make a badge so anyone can donate on your facebook page! Go to your dashboard and click the "create a badge"
Congratulations you can now receive donations over facebook! Now, no matter which avenue your donors choose you can accommodate them! Churches and Nonprofits receive $100 off your first kiosk stand order, plus a free card reader (worth $100) with each kiosk stand ordered! In this newsletter you can learn how to promote your tools to collect donations. Promoting your tools is very important. People want to give to your cause and now you can show them just how easy giving can be! Lets get your donors on board and informed about what your exciting fundraiser is going to do! Here are some tips on how to introduce your givers to donating through your new Continue to Give easy giving avenues. Make an announcement from the pulpit, in a newsletter, or in your church bulletin that you have a new way to receive donations. Send out an email to your supporters reminding them and showing them the new ways they can easily donate and even set up a worry free recurring donation. Share your Continue to Give profile on facebook. Remember keep your donors up to date on your new giving avenues. Let them know you've made the switch to Continue to Give! Watch Your Fundraiser Meet Its Goal! Remember keep your donors up to date on your new giving avenues. Let them know you've made the switch to Continue to Give! Churches: Print your personalized QR code in your church bulletin so that anytime during the service the congregation can take there time to give right on there mobile phone. Missionaries, Individuals, Nonprofits: Save money by printing your QR code in your newsletter instead of sending personalized and stamped return letters! Anyone: Make posters and make sure to print your QR code on them. That way anyone who sees it can quickly use their smartphone to give! Churches: Set up your kiosk stand right outside your church sanctuary. This will allow your congregation to give before and after the service. Anyone: Bring your Ipad set up with your Continue to Give giving app and your card reader to a fundraising event. Allow people to give with their credit card right at the event! Use our point of sale mode for quick fundraising purchases. Now you can sell those candy bars or run your fundraising bake sale and take credit cards! You can also use our point of sale mode for payment of fundraising silent auctions! Choose your badge and integrate it to your personal website! Now anyone who visits your homepage can give without being redirected. You can also set up a giving page on your facebook page! Imagine everyone who likes your page will see and can donate without ever leaving facebook! Remember only your creativity is the limit to what you can use our free tools for! Missionary support allows you to add missionaries under your church profile! Now missionaries can get the church/non-profit rate instead of the individual rate! What is a Missionary Account? Missionaries are another subset of the church account. The money that is donated to a Missionary flows through the Missionary's Continue to Give profile page into the church bank account. Then the church in turn allocates the money the missionary collected to the missionary. All donations given to the missionaries are easily trackable by using your reporting tools! In addition, the Missionary has their own profile page, can make their own projects, and have access to all their own tools! This will allow the missionary to take charge of raising their own funds! Missionary Support is similar to a friends request. Have your missionary set up a missionary profile page and send a request to your church to become a missionary of your church profile. Once you receive that request accept it! Congratulations! You now have missionary support! 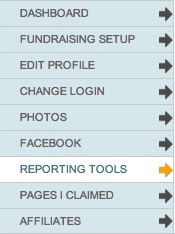 Now that you have started to receive donations let me show you how you can use our reporting tools for bookkeeping. While logged in click on the "My Setting" then Account Settings text in the upper right corner of your screen. Click on the "Reporting Tools" tab on the left side. Your reporting tool options and what they can do for you! TRANSACTIONS I RECEIVED - Click on this tab to download all your donations for easy bookkeeping. 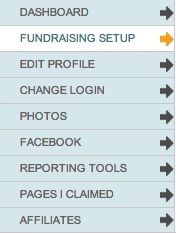 You can use the different filters to pinpoint your donations by a time frame or project. Then you can export that data by clicking on the "Export to CSV"
RECURRING TRANSACTIONS I RECEIVE - Now you can see who has a recurring donation set up with you. 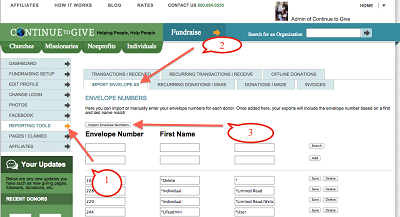 ENVELOPE NUMBERS - Here you can import or manually enter your envelope numbers for each donor. Once added here, your exports will include the envelope number based on a first and last name match. RECURRING DONATIONS I MAKE - Manage recurring donations you have setup. DONATIONS MADE - Look at donations you have made. OFFLINE DONATIONS - Manually enter donations not made online to be added to your donation list. MONTHLY INVOICES - Export your monthly invoices. BATCH REPORTING- This shows you how the transactions batched out to your bank account. Don't worry we've got you covered! Every time a donor gives we send them a receipt to their email and you a copy of it! Do you already have a coding system for your bookkeeping. Let us help you keep that straight by offering you Envelope #'s! Envelope #'s allow you to import or manually enter your envelope numbers for each donor. Once added here, your exports will include the envelope number based on a first and last name match. While logged in go to your dashboard and click on the "Reporting Tools" tab. For those that are currently using Church Community Builder, this is step by step process to integrate your Church Community Builder with your Continue to Give donation exports. There are three main steps. 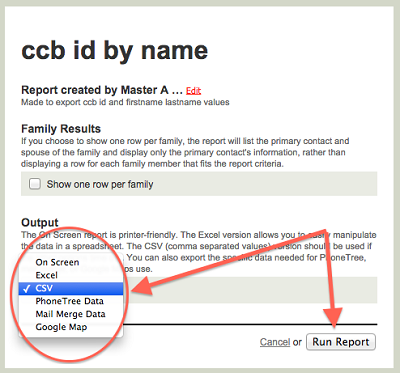 Add your existing CCB donor IDs to your Continue to Give reporting tools. Export your Continue to Give report. Import your Continue to Give report into your CCB. Let's get started! 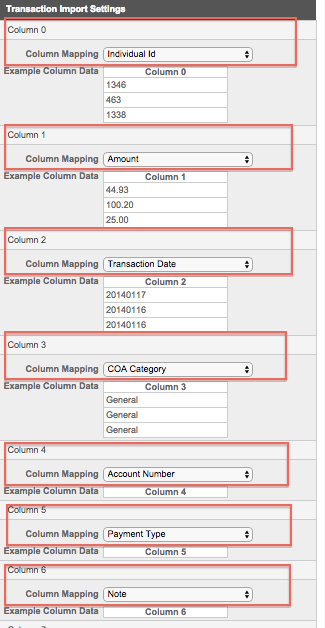 Your chart of accounts in Continue to Give needs to match your Chart of Accounts in your Church Community Builder. This will allow you to to keep your financial records straight. 1. First let's update your chart of accounts for your main account by going to your "Edit Profile" tab in your dashboard. Here you can add your chart of accounts. 2. Now lets update your chart of accounts for each project you have. If you don't have any projects you can skip this step. 3. 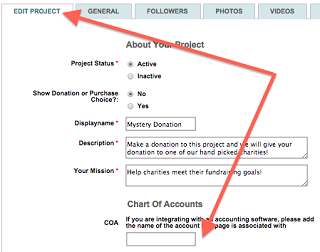 Once you have clicked on your project, go to the "Edit Profile" tab and fill in your Chart of Account name for this project. 4. Continue to do steps 2 and 3 until you have made a Chart of Account for each project. Now that you have all your accounts from your Church Community Builder in your Continue to Give account, we can now proceed. 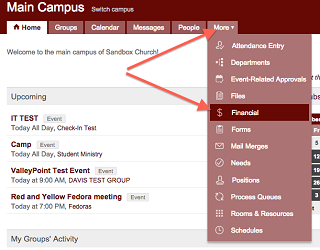 Log into your Church Community Builder and Click on the "Reports" tab in the upper right have of your screen. 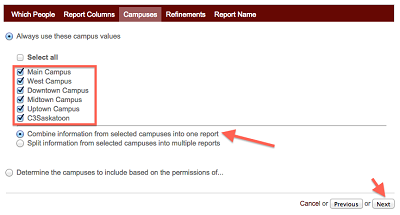 Click on the "Build a new custom report"
Add one field called "Individual ID" then click "Next"
Make sure all of your campuses are selected and also select "Combine information..." as seen below. 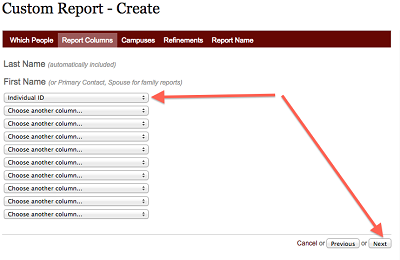 Then click "Next"
Check the indicated boxes below then click "Next"
Name your report and write a description. 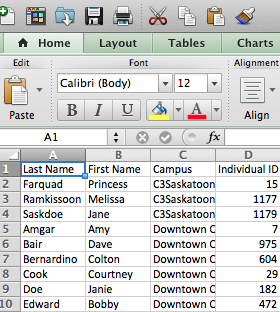 Then click "Save and Run this Report"
Click the Output drop down bar and choose "CSV" then click "Run Report." Save this report to your desktop where you can easily find it. Open that CSV file you just saved to your desktop. 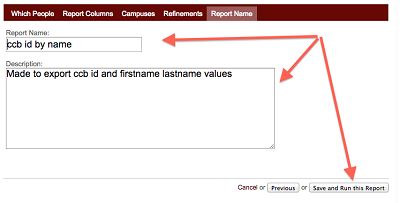 It should look like the picture below and in the order "Last Name, First Name, Campus, Individual ID"
We need to rearrange this excel sheet so that it is in the order of "Individual ID, First Name, Last Name"
First highlight the column "Campus" and delete it by right clicking on the "C" column and clicking Delete from the menu. 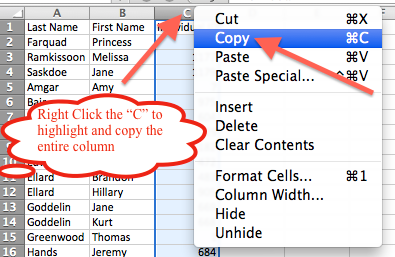 Next rearrange the existing data by copy and inserting until you have the data arranged by "Individual ID, First Name, Last Name"
To copy and insert columns: First right click on the top of the column you want to copy and click copy from the menu. 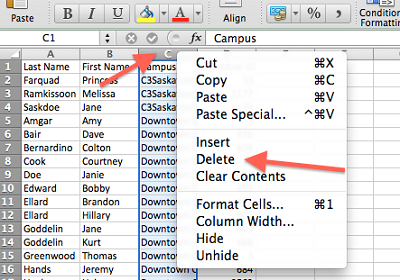 Then Right click on the top of the column where you want your data to be inserted and click "Insert Copied Cells." 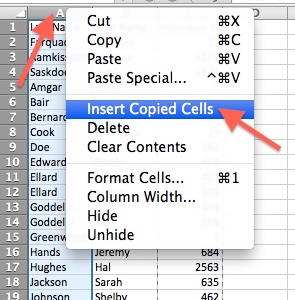 Once you have copied your cells to where you want them delete the old column that you originally copied. 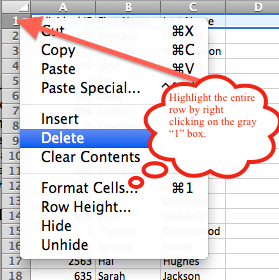 Now that your columns are in the order "Individual ID, First Name, Last Name" now delete the top row column headers by right clicking on the "1" gray box and choosing "Delete" from the menu. Now that your data is in the order of ID, First, Last name with no headers, you can save this file back to your desktop. 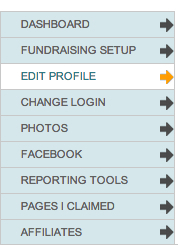 Log into your Continue to Give profile (Make sure you are logged in as your Organization). First find your reporting tools. Second, click on your "Import Envelope #s" tab. Third, click "Import Envelope Numbers"
Choose the file you saved to your desktop and click upload. Once the upload has completed you should see a report like the picture below where you have Updated alternate IDs, Newly imported alternate IDs, Failed Records. Then close out of this by clicking the little "x" button in the right corner. Now all of your CCB ID's have been matched by first and last name to your Continue to Give donations. Now lets export your Continue to Give donations report so we can upload it into your CCB to update your congregations giving. In your reporting tools, go to your "Transactions I Recieved" tab and click on the "Export for CCB" and a box will pop up and click "Yes, Export for CCB." Save this file to your desktop as "CCB" or something that will not confuse you with the last file you saved to your desktop. Go back to your Church Community Builder account home page. Click the "More" tab and then click "Financials"
Click on the Imports tab and click "Change settings"
Match all 6 column settings as seen below in this screen shot (7-12 will be marked "Not Used"): Scroll to the bottom of the screen and click "I'm Finished"
Now that your settings have been created, choose the CCB file on your desktop that you downloaded from your Continue to Give reporting tools. Check the "First Row" box. Then click "Upload Transaction Information." Your donations are now imported to your CCB! Scroll to the bottom of the page and click "Create Transactions"
Congratulations! Your CCB is now updated with your donations from Continue to Give!